Sweden is a strikingly beautiful country with virtually no poverty and a profound reverence for a clean, tidy, and orderly natural environment. With a strong commitment to maintaining a safe and secure “home of the people,” the Swedes are justifiably proud of creating what they consider to be a near-perfect society, with basic health, education, and social welfare benefits for all. Sweden’s extremes in geography, climate, and history have given rise to a national personality that reveres homogeneity, honesty, self-sufficiency, and earnest, self-effacing sincerity, and avoids conspicuousness and confrontation. The end result is a person who is modest, reserved, and romantically nationalistic. Underneath those layers, you will find a dry sense of humour, a fervent adoration of nature, and a great love of home and family. While the younger generation has readily embraced new ideas and change, it is certainly true to say that all Swedes retain a deep respect for their own cultural legacy. As such a good background knowledge of the beliefs and values that make up the Swedish way of life will prove invaluable for anyone visiting the country and hoping to do more than just scratch the surface. Culture Smart! 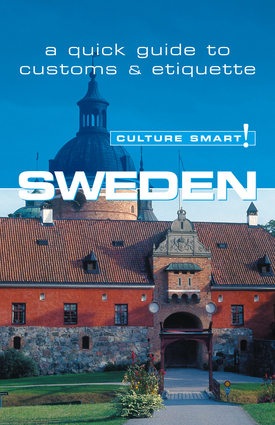 Sweden offers valuable insight into the social and business lives of the Swedes today. Along with tips on communication and how to approach particular situations, concise chapters on key historical events, and the customs and attitudes that inform the Swedish way of life will afford the visitor with the confidence and sensitivity to make the most of his/her experiences in this beautiful country. Traditionally, and particularly in the north, Swedes are uncomfortable with small talk in casual conversation, preferring silence to nonsense. As such, let conversation develop organically, not to be filled with too many unnecessary niceties!